Buffalo Transport specializes in SAME DAY service throughout Western New York, as well as NEXT DAY and SAME DAY service to and from Southern Ontario. 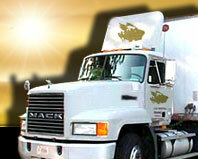 Our company's success has been built by providing the most reliable service in this area's local cartage market. We are always aware of the fact that timely, damage free service is critical to the continued growth with your customers. When given the opportunity, Buffalo Transport handles this responsibility in the most professional and efficient manner possible. Market area extends from Northwest Pennsylvania to Syracuse. Buffalo Transport has evolved into the premier carrier for this region. Service to and from Southern Ontario is one of Buffalo Transport’s specialties. Our market area extends to Toronto and all of its suburbs. Service to further points is also available based on capacity. We utilize the PARS system to facilitate the border process for all shipments moving Northbound, and have solid working relationships with all brokers. For all Southbound shipments, we utilize the PAPS system, where necessary. NO BREAKDOWNS. Equipment is purchased new and meticulously maintained. PROFESSIONAL SERVICE: Uniformed, courteous, helpful drivers.